"Traditionally in the Spring I like to dress up like a French tourist. Or, what I idealize as a French tourist." 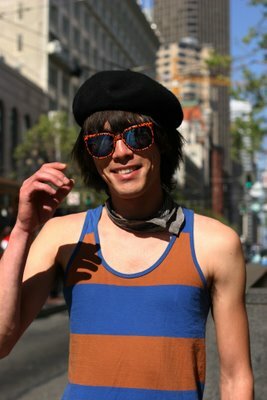 Beyond his colorful slim cut clothes, the beret really does it. A look at his shoes and very lovely bag.
" the clothes are quite simple yet the colors are saturated, and i like it... its blend really great.! i like the style and that cozy bag. " I'm a fan. Love the bag! I wonder how long it takes him to put those pants on though.